Lightning Fighter by Uwan Studio is an app for the iPhone, iPod Touch, and the iPad. This game looks like a modernized Raiden. Like the classic vertical shooter, you pilot a jet while collecting power-ups and shooting enemy aircraft, tanks, etc. Lightning Fighter borrows many things from Raiden such as some enemy designs and power-up icons but it also does a few things differently. Like other arcade shooters for the iDevices, Lightning Fighter has you move your aircraft around with your finger while the game shoots automatically. Try to collect the same power-up to increase the weapon’s capability but you have to time it otherwise you will get a different weapon. A supershot can be used when the S button is full. This attack is different depending on which weapon you are currently using such as a concentrated spread laser beam, homing lasers, or a barrage of missiles. Bombs can be used manually but will be used automatically when you get hit. Bombs in this game are unique since they will take a hit for you. Another thing about this game that is different than Raiden is collecting gems which increase your score. There is a leadersboard that keeps tracks of scores for all difficulty settings. You can choose tilt controls but I would not recommend it since you would most likely want to dodge attacks in a more precise way. As I’ve said before Lightning Fighter looks like a modernized Raiden. The images are polished and colorful. Some of the enemy designs in Lightning Fighter look very similar to Raiden’s designs. The weapons are a bit different. There is no purple homing energy beam but there is homing lasers that come from the back of your ship. The bomb looks the same in icon design and when used. In the end Lightning Fighter looks so similar to Raiden, I wonder if anyone who worked on that game is involved with this app. The audio is something I don’t remember from Raiden so I cannot compare it to Lightning Fighter. The sound effects for this game are nothing special such as lasers firing to things exploding. The music can be repetitive and there is no iPod music support. I think the music and sound effects are fine but after a couple of stages and retries I grew tired of them. Lightning Fighter costs $1.99 in the App Store. There is a free version so you can try it out before you buy it. I got this app because I wanted to play a classic arcade shooter. I like it but it made me wanting more such as different aircraft to choose from. I thought the bomb was an interesting idea but can be inconvenient such as when I want clear the screen of enemies but remembered I got hit before and can’t use as a result. Overall, I think Lightning Fighter is a nice take on a classic series but it left me wanting more. 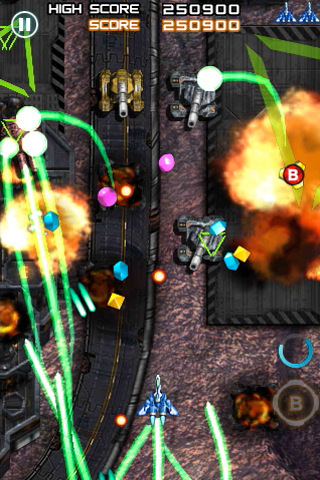 Sample the free version of Lightning Fighter on your iPhone. 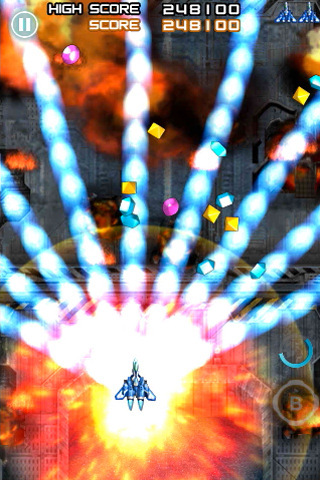 AppSafari review of Lightning Fighter was written by Tony Lau on April 27th, 2011 and categorized under App Store, Arcade, Games, Scrolling Shooter, Universal. Page viewed 4198 times, 1 so far today. Need help on using these apps? Please read the Help Page.